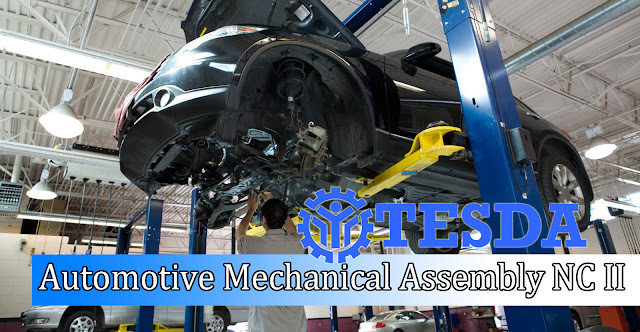 One of the short courses offered by TESDA in the Philippines is the Automotive Mechanical Assembly NC II (2). It takes a minimum of 143 hours to complete this course. You will learn and train here the proper procedure of installing mechanical parts into automotive. Student who completed this course can apply as an automotive mechanical assembly technician and maintenance technician. They can also find jobs abroad related to the Automotive Mechanical Assembly. Tesda courses that can use abroad. All Filipino who wants to enroll must have a Birth Certificate (NSO copy), High School Diploma, Police Clearance, Barangay Clearance, Good Moral Character Certificate or Honorable Dismissal and 2x2 or 1x1 picture (white background). After finishing the course, trainees must take and pass the National Competency assessment exam before National Certificate (NC II) will be issued.